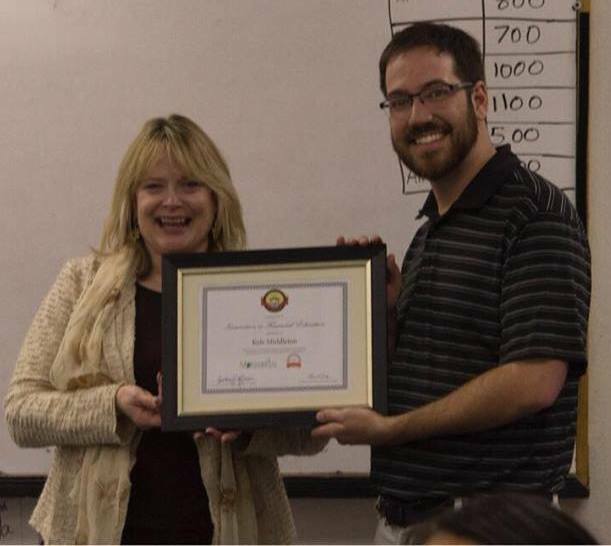 MVCKS teacher Kyle Middleton receives the 2017 Innovation in Financial Education Award from Attorney General Cynthia Coffman. I would like to begin this week by congratulating Mountain View Core Knowledge teacher Kyle Middleton for receiving the 2017 Colorado Innovation in Financial Education Award! Colorado’s Attorney General Cynthia Coffman actually came to the school to present this special honor to him when she visited the Cañon last month. 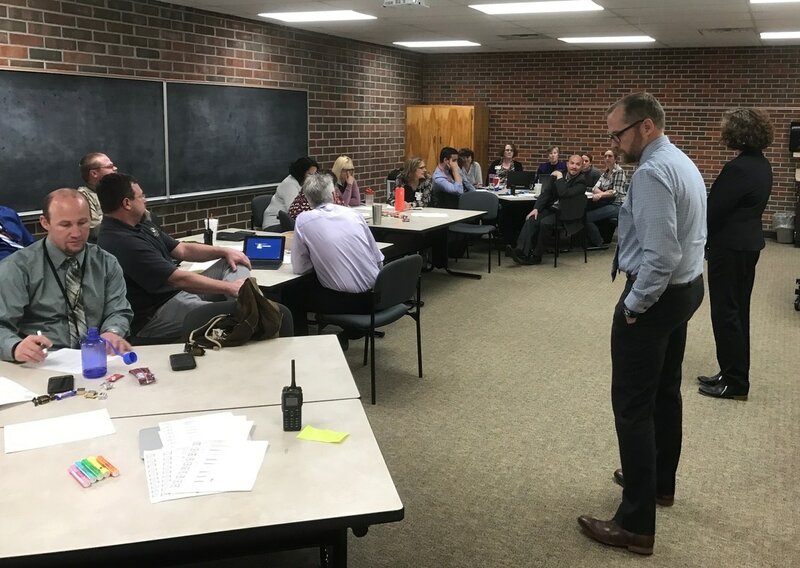 I also want to thank Cañon City High School principal Bill Summers and several of his staff members who have committed to attending a Project Based Learning course in Fort Worth, Texas late this week, and during their first weekend of spring break. I look forward to seeing this strategy implemented in our new Tiger Open Pathway program at the high school, as well as in regular CCHS classes, and I very much appreciate our folks being willing to give up some of their spring break time to learn this important strategy. Last week director of instruction Adam Hartman and Washington Elementary Teacher on Special Assignment Kelly Albrecht kicked off our district focus on supporting instructional leaders in coaching teachers to increase their use of student engagement strategies. This work will be our major instructional focus for the 2017-18 school year and both Adam and Kelly are helping leaders to be more supportive of teachers in this area. Washington Elementary principal Brain Zamarripa shares his school's rating with his staff at an early morning smoothie party. Parents of Cañon City 8th graders should mark April 13th on their calendars. Beginning at 5:30 PM that evening Cañon City High School will be holding its annual Freshman parent orientation meeting. While at Cañon City High School last week I witnessed the Building Leadership Team voting to create a process by which the 2017 Freshman class must earn the right to participate in open campus at lunch. The standard set is related to student grade point average, behavior, and attendance. Current Cañon City 8th graders can earn the right to participate in open campus for the first quarter of the 2017-18 school year based on performance in these areas during the spring 2017 4th quarter. Data shows somewhere between 50 and 60 of this year’s Freshmen would not have earned the right to partake in open campus if the practice were in effect this year. In early February we conducted mid-year building evaluations of the instructional programs at McKinley and Washington elementary schools. Last year McKinley earned a score of 60 out of 100 on their end-of-year evaluation. This led us to believe the Wildcat staff was on the cusp of earning a Performance accreditation rating, the highest an individual school in Colorado can achieve, and it turned out they did exactly that! As a result of our mid-year 2016-17 visit, and clear evidence that McKinley students are growing in literacy at the highest rate in our school district, their rating increased to a 70 out of 100. Great job Wildcats! Meanwhile, based on a number of measures last year we identified that Washington Elementary School was struggling a bit when it came to their academic improvement focus. The school’s mid-year rating for 2015-16 was only a 50 out of 100. However, because of excellent student growth during the spring semester, the school retained its Performance rating under the CDE School Performance Framework system. After visiting the campus again this February it is quite evident Washington’s staff has a shared vision of excellence, is collaborating on student academic improvement, and has benchmark reading and math growth results to prove they are doing quite effective work. In a building level survey last year only 32% of Washington’s staff felt the school was headed in the right direction instructionally. This year 95% of the staff feels the school is on the right track. As a result Washington grew its building review score to 70 out of 100! I want to offer kudos for this hard work to both the McKinley and Washington staffs for their tremendous focus on doing the right work that results in increased student opportunity and achievement. Based on work accomplished in our calendar committee last week parents can safely mark Monday August 21st as the first day of school for the 2017-18 school year. Staff members can mark Monday August 14th as the first day they must report to work. Our only hold-up on completing a calendar at this point is making a decision on exactly when we will conduct spring break. Director of Instruction Adam Hartman and Teacher on Special Assignment Kelly Albrecht present to instructional leaders on how to support teachers to teach in a highly engaging fashion. CCHS principal Bill Summers and counselor Christy Graham explain progress made on the EARSSS grant to CDE representative Janelle Krueger. Last Monday morning I worked on personnel and truancy matters. That afternoon I met with our instructional leader Professional Learning Community to begin focussing on high student engagement strategies, and then I conducted a calendar committee meeting. On Tuesday morning I attended the CCHS Building Leadership Team meeting, appeared on Morning Line, and conducted a Superintendent Advisory Council meeting. I then had a number of one-on-one meetings throughout the rest of the day. On Wednesday morning I had a monthly breakfast meeting with our Classified Association officers. I also had a chance to stop by Washington and McKinley elementary schools to celebrate the growth they showed through their building review processes, while peeking in on a CDE visitation about the implementation of our Early Literacy grant at Harrison School. I attended a late afternoon Technology Visioning Committee meeting and an evening CCHS parent advisory committee meeting to end that day. On Thursday we had a CDE Expelled and At-Risk Student Support Services grant site visit, a meeting about the future of our Cañon Online program, and a Cañon 2020 committee meeting. I also attended PTO meetings at CES and McKinley before heading to Harrison to watch my daughter's choir concert. On Friday I attended a regional superintendent meeting, had lunch with board president Larry Oddo, and ended the day in a meeting with a concerned parent. Rachel Anderberg from the Colorado Department of Education discusses CCSD implementation of its Early Literacy Grant with McKinley staff members. My schedule for this Monday includes a meeting with Fremont County Sheriff Beiker, a meeting with district literacy coordinator Gina Gallegos, time set aside to work on communication items and principal evaluations, and a board work session and meeting. Tuesday begins with our monthly touching base meeting with the Cañon City Police Department, a Superintendent Advisory Council meeting, and a meeting with folks hired by CDE to do an assessment of the Washington Elementary facility. During the afternoon we’ll be holding a District Leadership Team meeting, and I'll end the day in a monthly Cañon City Education Association check-in meeting. On Wednesday I’ll work on principal evaluations, attend an operations department discussion meeting, meet with RE-2 school district personnel about collaborating in the process of setting up student internships and apprenticeships, meet with our probationary teacher development coach, and attend a Communities That Care Ley Leader meeting. On Thursday I’ll have my monthly touching base meeting with RE-2 superintendent Rhonda Roberts, a session with PCC Fremont Campus president Dr. Lana Carter, attend Leadership Day at Washington Elementary and end the day at a meeting of community members who are interested in attracting a Y.M.C.A. to Cañon City. On Friday I’ll attend a Schoology webinar with director of instruction Adam Hartman, and then hopefully an all day classified employee association bargaining session.